My wife and I moved into our first house, almost 26 years ago. We had a lot of stuff, combining our two apartments, but I decided to get a new, great big 27-inch television. We'd gotten friends and coworkers to help move things in, so that part was fine. The boxes and furniture were in the house in about two hours. Then my wife went out to buy some food for our helpers. While she was out doing that, the guys and I decided to set up that new television. This was America in the 90s, pre-internet, when television still mattered. We had to get that television up and running. A couple of guys arranged furniture in the front room while my friend Doug and I moved the entertainment center into position. That entertainment center was huge, covering half the wall. 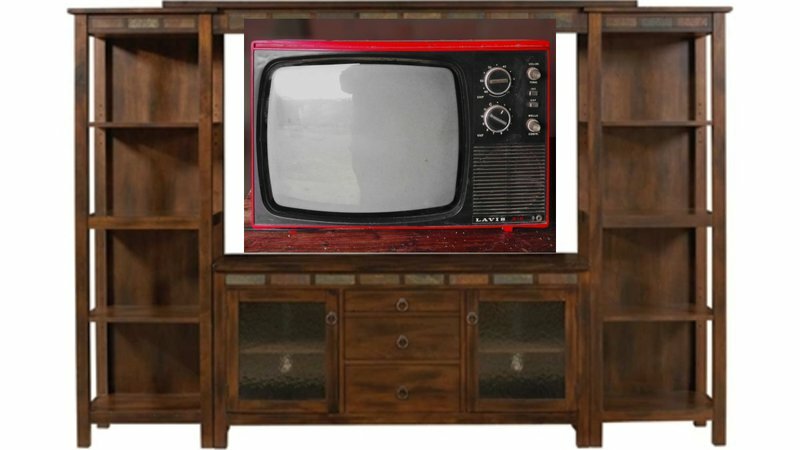 That was a thing, back then: make a statement about your house with the entertainment center. It was big enough for a television, cable box, VHS player, and shelves for a four-piece stereo. At the bottom was a drawer for all kinds of stuff. Then we un-boxed the new television. 27 inches was among the biggest at that time. This was a huge, heavy tube and it was awkward for one of us to lift. But two of us could move it just fine. But we hit one little snag: the television wouldn't slide into the entertainment center. It wasn't built for these new, ginormous 27" televisions. The place for the television had this nice fascia over it. If that fascia weren't there, it would just slide right in. So with my wife still out shopping, we stared at the problem a while, trying to figure out the best way to remove the fascia. Finally, Doug asked, "Do you have a saw?" I did have a saw. I had a power saw. I knew exactly which box it was in. Three minutes later, the saw was plugged in, a quick measurement was made, and I was ripping into the wood. I stripped away the fascia on the sides and the top and, lo and behold, the television slid right into that entertainment center. I cleaned up the mess, put away my saw, and was feeling rather proud of myself. Then my wife came home. She came into the living room to admire the work we accomplished, and found us all watching television for a hard-earned break. "Oh, well," I said, "the new television didn't fit in the entertainment center, so I had to make some modifications." She inspected my craft work, saw how it fit, and how much of the fascia I had removed. Now, under the glare of her look, I could see how the cuts weren't quite straight, and the exposed wood looked pretty bad really. So I could have done better but, surely, there would be respect earned for having solved the problem so quickly. She turned off the television and faced us. "You realize," she said, "that the television goes in through the back, right? The opening is larger, in back, by design." "Nope," I said. "I did not know that." I've been designing this next story I want to write for going on three months now. I think I'm close to wrapping up. Once I wrap up, I start writing. I'll be writing for at least four months. I am trying to write short stories, such as the one above, more regularly. Either humor pieces or these memory pieces, for fun. I hope you enjoy them.